Let's take a quick look at both. 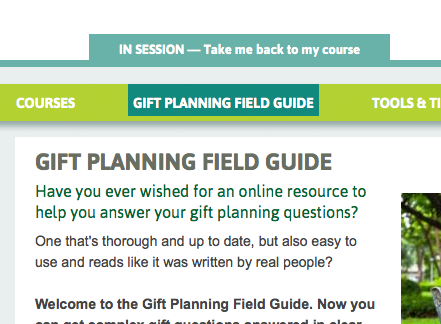 Course content is designed such that you start at the top and make your way down through the links in the left-hand menu. Please note that the course structure requires you to go in order -- you won't be able to access the content further on in a course until you have read the pages that come before it. 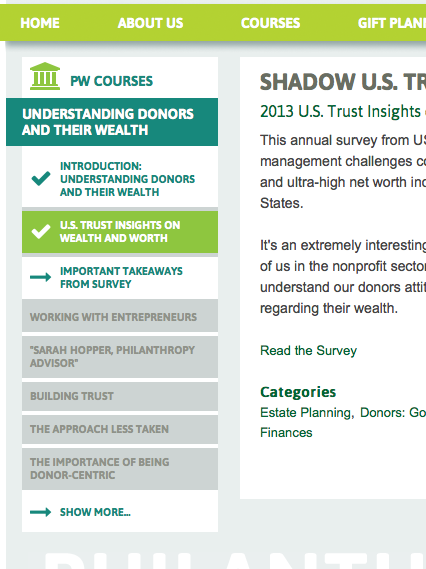 In a given course, some of the content may be linked in from another section of Philanthropy Works. As such, the links built into certain pages will lead you away from the course you're working on. 1. Your Account. 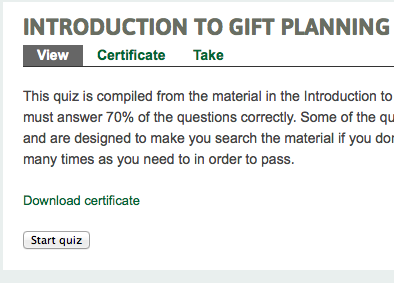 Go to the Your Account page and click on Courses -> Completed. This will show you all the courses that have been finished. Also listed will be any courses that are in progress. Feel free to take a screen shot of this page or print it.